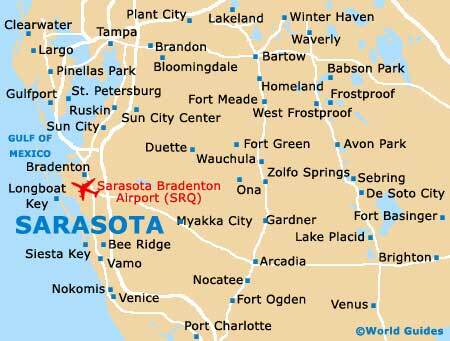 The city of Sarasota enjoys a warm and humid, sunny and subtropical climate, with an annual average temperature of 72°F / 22°C. Visitors can expect hot summer months and pleasantly mild winter weather. The summer season is always hot and July, August and September are the hottest months of the year, when temperatures can reach a scorching 91°F / 34°C. 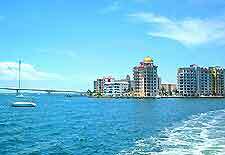 Holiday makers should also note that summer is the wettest season in Sarasota, while the dry season runs from October through May. Winters are far from being chilly and cold. January is the coolest month of the year, when daytime temperatures are around 73°F / 23°C, but temperatures can drop to 51°F / 11°C. The annual average precipitation is 145 cm / 57 inches. Sarasota Weather Charts - further Sarasota climate statistics and charts.